So Katie's grandma takes her to the museum to see the dinosaur bones, and promptly sits down to have a nap, leaving little Katie to explore on her own. Bad idea! 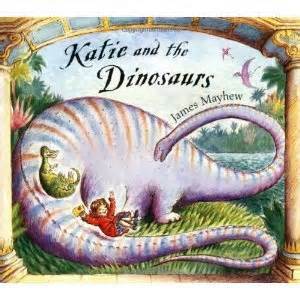 Katie, after happily viewing all the fossils, goes down a dark corridor, opens a forbidden door, and finds herself in Dinosaur-time! 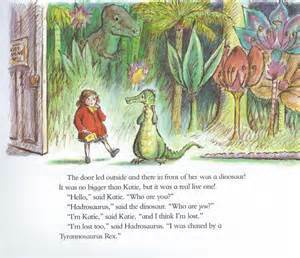 There she meets and greets and sees from afar various dinosaurs, helps a hadrosaur find its family, and is chased by a T-rex. I think I read this one! I would've been two when it came out, which is about the right age.